Cottonwood Restaurant & Bar opened New Year’s Eve 1988. The restaurant not only recently celebrated its 30 year anniversary in the area, but Feb. 1 marked the four-year anniversary since Robert Green and Kathy Kearley-Green took over as owners. The holiday season for restaurants in the Truckee-Tahoe area is always stressful for staff and management. Reservations are made well in advance for packed dining rooms, family is in town, and expectations from patrons are high to say the least. For owners of Cottonwood Restaurant & Bar, Kathie Kearley-Green and Robert Green, this past December presented a nightmarish scenario where the restaurant was down both executive chef and sous-chef heading into the busiest stretch of the season. But by leaning on the experience of its staff, Cottonwood closed 2018 out in style, celebrating 30 years in the area on Dec. 31. “We really saw what a family Cottonwood is when that all happened,” said Kearley-Green. From the restaurant’s office manager taking over food-ordering duties and a first-year dining room manager pulling off packed floors each night to Green heading into the kitchen to slice potatoes and mushrooms, the crew came together like ingredients in a dish to make it through the bustling holiday season. During that time, Cottonwood’s owners also found new talent behind the grill in an unlikely place. “I put an emergency ad on Christmas Day on Craigslist, looking for somebody that had some senior chef experience and I got a response that night from a young guy, who had been up visiting in Paradise when the Camp Fire came through and he lost his truck and he lost his stuff,” said Kearley-Green. Kathie Kearley-Green and Robert Green bought their first home in Truckee in 2001. Shortly after, the two were introduced to Cottonwood by Kearley-Green’s aunt and uncle, who were visiting on a ski trip. Many years later, the two heard longtime owners Mike and Jennifer Blide were planning on selling the restaurant. Green, who practices law in the Bay Area, said the opportunity provided a nice change of place from his duties as a lawyer. 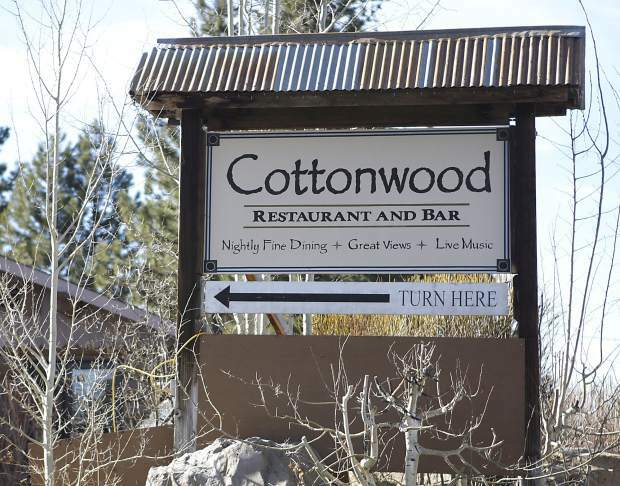 Once the two took over Cottonwood, they said the focus was on maintaining the tradition and history of the restaurant, which overlooks downtown Truckee from a 1920s-era warming hut and was the site of skiing, ski jumping and tobogganing events. “We view ourselves as sort of the caretakers of this historical facility. As long as the restaurant is running there’s a way of maintaining that history, and a lot of people can come and enjoy it,” said Green. On Feb. 1, the owners of Cottonwood celebrated the four-year anniversary of taking over the restaurant. After taking ownership, the Greens set out on updating certain aspects of Cottonwood while walking the line of maintaining the site’s history and what longtime patrons have come to expect from the eatery. This past year Cottonwood has rolled out new menu items with the change of each season, straying away from many of the restaurant’s longtime dishes. Among the new favorites on the menu, according to Green, have been the steamed Manila clams made in a frenchy tequila lime broth, and one Cottonwood’s newest items, a smoked elk sausage. Cottonwood’s dishes have longtime been paired with live music, and under the Greens that hasn’t changed with several live acts booked throughout the month. The restaurant is also gearing up for Valentine’s Day with a special five-course menu. Moving ahead, the owners of Cottonwood said they hope to continue to build on the past four years while maintaining the same atmosphere that has endeared it to locals and visitors during the past three decades. For latest menu items and reservations, visit CottonwoodRestaurant.com.